The arrest of scores of ordinary people campaigning against water metering. Mobilisation of the Public Order Unit (riot squad) into housing estates and the use of pepper spray against peaceful protestors on more than one occasion. 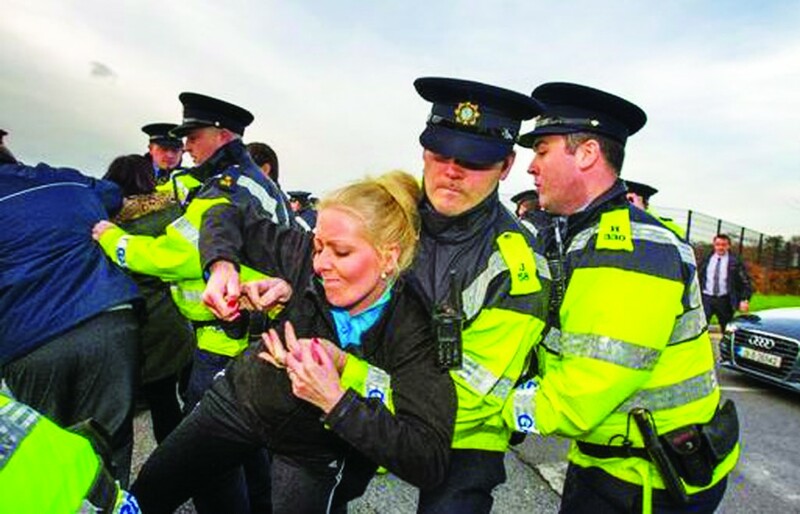 The manhandling of hundreds of campaigners including the violent hurling of a woman into an iron bollard whilst protesting Taoiseach Enda Kenny. Coolock Garda station was picketed twice – once by 600 people protesting the arrest of three campaigners, once by 200 women carrying signs such as “Women Against Garda Brutality” and “Stop Violence Against Women”. The Gardai have effectively acted as private security for water meter installers such as GMC Sierra owned by billionaire capitalist Denis O’Brien. 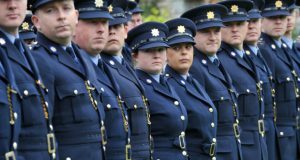 The mass sharing of footage of the Garda interventions on social media has opened the eyes of many to the role of the police in capitalist society. In every capitalist society the police, far from being a “neutral” force serving society and solely concerned with crime-stopping, act as enforcers for the rule of the rich and powerful. This is as true for the Garda Siochana in Ireland as it is for other police forces elsewhere. This truth was shown in recent years with the use of the Gardai against the community in Rossport, Co Mayo campaigning against Shell Oil; against the Thomas Cook occupation in 2009; and with Garda assaults of student demonstrators in 2010. 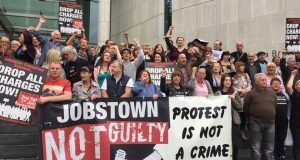 But the anti water charges movement has opened the eyes of far more people to the role of the Gardai mainly because this struggle is far bigger and is being watched by far more people. 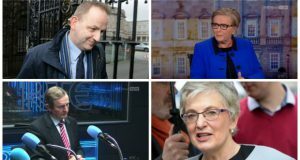 The Socialist Party believes that the Gardai, instead of being accountable to a Commissioner appointed by the Government, should be democratically controlled and held to account by working class communities through elected policing committees. The police should play no role in policing peaceful, community and legitimate protest. 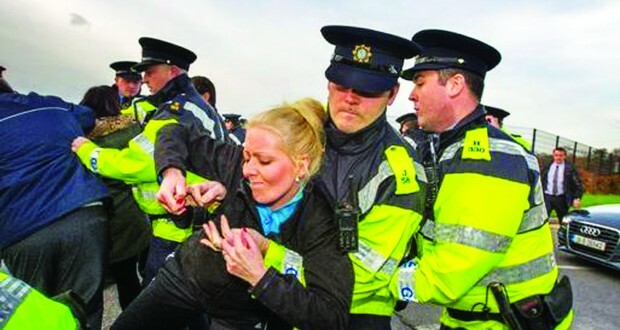 Gardai who manhandle or abuse peaceful citizens should be removed from the force. We need a police force that should be answerable to working class people and communities not the political masters acting on behalf of wealthy vested interests.